Consultation is by appointment. Patients presenting without an appointment will be fitted in at the earliest available time. Urgent medical matters will always be dealt with promptly. Please “check-in” with reception on your arrival to avoid an unnecessary delay in the waiting room. Please cancel appointments prior to the allocated time. Every effort is made to keep to appointment times but this is difficult due to emergencies, walk-in patients or unexpected longer consultations. To help us schedule appropriately, please tell our receptionists if your consultation is likely to be long (e.g. insurance medicals, postnatal checks, pap smears, counselling, excisions, and if more than one member of the family is to be seen. Visit our website https://healthengine.com.au/book/69522 and book your next appointment online. We endeavour to help you see the doctor of your choice. All evidence suggests that communication between doctor and patient is improved when a good relationship exists between both parties. We recognise it is not always possible to see the same doctor, so our system of recording notes takes this into account. We have several measures to assist in streamlining the waiting room and improving patient flow in our Medical Centre. Please advise the type of appointment you need when booking, or if the Doctor or Nurse has advised you about getting something done at your next appointment. Please remind reception on arrival. Disposable equipment is used in many instances to ensure patients safety. This practice is in compliance with Australian safety standards and health regulations implementing the use of disposal equipments. If you require medical attention afterhours please ring House Call Doctor on 13 55 66. For emergencies ring 000 or attend the closest hospital to you. Doctors can take phone calls when time permits. If busy, or involved with another patient, they may elect to call you back. The nurse can help determine urgency. Most problems are best dealt with in a consultation. The doctors can perform many minor surgical procedures if required (e.g. removal of moles or skin lesions, treatment of simple fractures). Cryotherapy (for skin cancers and warts etc. ), nebuliser, pap smears and resuscitation equipment are available. A longer appointment time may be required for some procedures so please inform the receptionist. The doctors in the practice can perform electrocardiograms (ECG), lung function testing, and blood sugar testing, pregnancy tests, hearing tests. Blood collection for pathology, X-rays, CT scans, ultrasound, mammograms, and endoscopy tests can be arranged elsewhere when needed. Patients are required to return for a consultation to obtain test results, preferably with the doctor who ordered your tests. If any results are abnormal and/or require urgent attention we will contact you. To facilitate this, please make sure reception have your current phone number and address details when booking or on settling your account. To further improve our service to you, we have implemented a Patient Register for Preventative Activities. This is a Reminder/Recall System in which we contact the patient by either mail or phone for follow-up of a preventative activity such as a skin check, cholesterol check, blood pressure check, Pap smear, Mammogram or Prostate examination etc. Our practice also takes part in state and territory registers which help us work out who is due to be seen. Patients attending this practice will automatically be included on our Reminder/Recall Register. Patients are requested to inform the Doctor, Nurse or Reception if they choose not to be included. You will need to sign a form if so, for us to keep on record. We also offer the opportunity for patients to initiate these reminders/ recalls to be sent to them. Please speak to your doctor or nurse about arranging this. The purpose of this register is purely as a service to patients from this practice and confidentiality is ensured at all times. If you wish to opt out of our recall system please tell your doctor. Referrals to a specialist may be made during the consultation. Standard referrals are valid for one year so please ensure you book an appointment before your referral overdue. Prescriptions may be written during a consultation. If you need repeat prescriptions, we ask that you make an appointment to see one of our doctors, where the condition for which the prescriptions are written can be checked. We are committed to helping our patients prevent the development of chronic disease. We encourage you to take advantage of our practice nurses and the time you spend with your doctor to “measure up” and have your modifiable lifestyle factors assessed. We can also offer Cardiovascular risk and Diabetes risk assessments. Please look for these tools in the waiting area or ask at Reception. Once filled in please give this to your doctor or the nurse. For our patients over 75 we recommend a yearly health assessment which is a comprehensive review of a wide range of health issues. Home assessments can be arranged. Patients aged 45-49 are also eligible and encouraged to have a detailed health check to help identify chronic diseases for which you may be at risk. If you require a copy of your records to be sent elsewhere our practice sends a summary for free, but may charge fees for preparing records. Our clinic is bulk billed. Patients with Medicare cards will have no out-of-pocket costs for standard appointments with bulk billing GPs in most cases, as it will be billed directly to Medicare. All doctors at the practice use the computerised BEST PRACTICE to record information, order tests, provide prescriptions and file Specialists reports. Our computers are password protected, and backed up daily. All information recorded at the surgery is confidential. We follow the Australian Federal Privacy Laws and Standards for the private health sector. 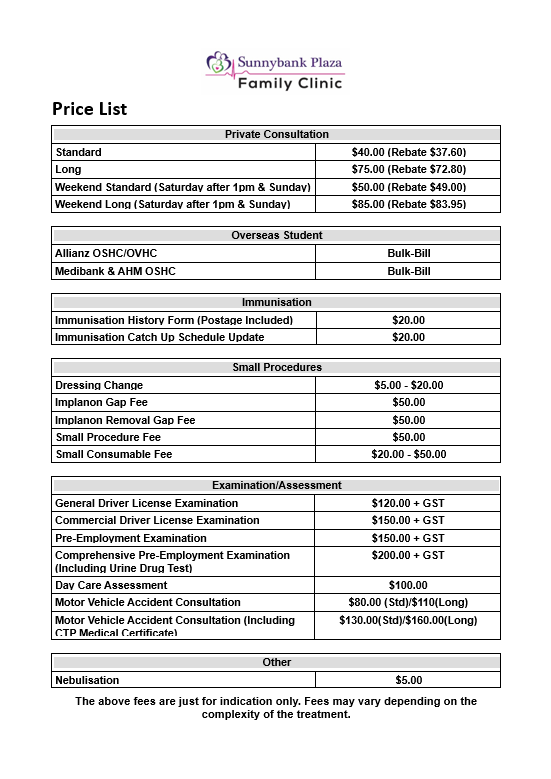 Please note that fees might defer depending on the complexity of consultation/treatment. Please advise reception staff the nature of your appointment in order for our staff to advise you on possible fees that may incur. Vaccine fees are subject to availability and quoted upon appointment booking.